As I share with you this recipe I am reminded of how thankful I am for each and everyone of you. If I didn’t have anyone to share my recipes with, cooking and creating recipes would not be so much fun. I am thankful that our paths have crossed on the big world wide web and for some, I have had the privilege to meet in person or even develop a friendship online. I am thankful to God for my talents and passion that keeps me going! I am thankful for my family and friends. I am thankful for my handsome and healthy sons. Even though it is pretty stressful raising a 20 month-old and 3-1/2 year old, they continue to teach me things everyday. I am not perfect but they still love me which makes me want to be a better person and a better parent. What are you thankful for? I hope you enjoy the recipe and Happy Thanksgiving! 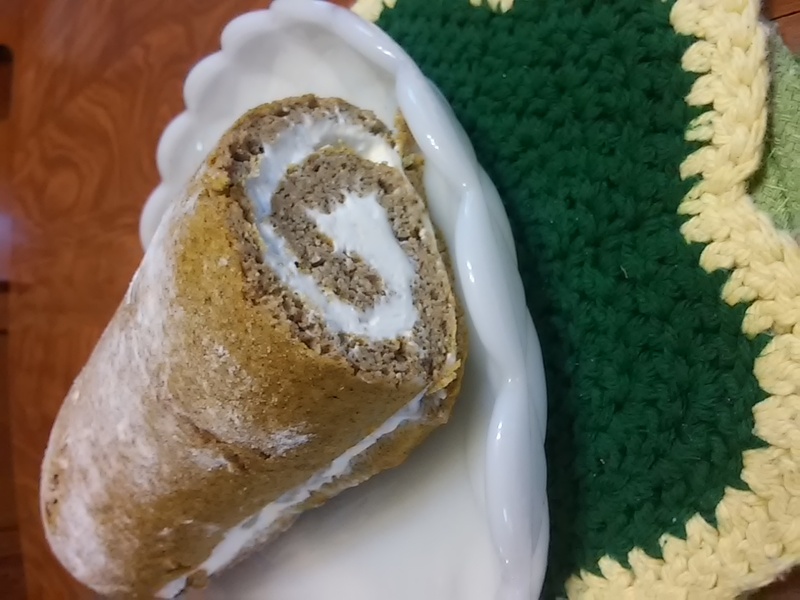 Grain-Free Pumpkin Roll… So much goodness all rolled up! Pumpkin Rolls are as traditional as turkey around the holidays but so many people are intimidated to make them. Please don’t let fear keep you from making this pumpkin roll! How do you roll cake and it not break?? Well, I’ll tell you and show you below! There may be other methodologies but when I made my first pumpkin roll about 8 years ago, this is how I did it and it turned out perfectly. I was anxious to see how my gluten-free and grain-free version would turn out and to my delight, it rolled up perfectly! Be sure to read my instructions carefully and follow the images below for the perfect Pumpkin Roll, worthy of the Thanksgiving Table! Like all of my recipes, this one can be modified to fit your specific dietary needs and goals. Here are a few modifications that I KNOW will work. If you modify it in any other way, please let me know in the comments below. Sweetener: I normally advertise using any sweetener you choose but, if you normally a sweetener like honey, I do not recommend doing that for this recipe so that the ratio of liquid to dry is not altered. It may work out or may not, I just have not tried it yet. Please let me know in the comments section what sweeteners (and the amounts) that you use! Nut-Free: NOTE: I have not yet tried the nut-free version using ground raw sunflower seeds in the place of the almond flour, but I will be doing this soon. Dairy-Free: Use coconut milk or almond milk and add 1/2 tsp. apple cider vinegar to the batter. I used THIS brand of coconut milk. Also use ghee or expeller pressed coconut oil instead of butter. Preheat oven to 325 degrees F. Butter the sides and line the bottom of a jelly roll pan with parchment paper. Set aside. In a medium bowl, add dry ingredients and blend well with whisk. Separate the egg yolks and add them to the dry ingredients and add the egg whites to another medium bowl. Blend egg whites with hand mixer until SOFT peaks form (not stiff). Add the remaining ingredients to the dry mixture and blend well. Then fold the beaten egg whites into the batter. When the egg whites are partially folded in, taste for sweetness and add more if necessary. Continue to fold in egg whites but do not over mix the batter. Using an angled spatula, spread the batter evenly onto the prepared pan. Bake for 15-17 minutes or until toothpick inserted in the center comes out clean. Invert warm cake (right out of oven) onto a slightly damp dish towel (one you have lightly spritzed with water) being sure that the cake is on the edge of the dish towel. Starting at one end, carefully roll the towel and cake up into a log. Place cake in the refrigerator for 30-40 minutes or until completely cooled. While cake is cooling, prepare Cream Cheese Filling. To a medium (high-sided) bowl add cream cheese and beat with hand mixer until smooth. Add remaining ingredients and blend until the frosting is thick and smooth. Taste for sweetness and adjust if needed. After cake has cooled, carefully begin to unroll cake from the towel. Let the cake that was inside remain rolled (don't try to flatten it out) as you spread the filling on the remaining cake. There may be cracks in the cake. This is ok just continue to cover the cake with filling being sure to go to the edges. Once you get closer to the inside of the roll you will have to carefully continue to fill with the filling so the cake doesn't break. Optional: Sprinkle the cream cheese filling with 1 cup chopped pecans. Carefully start with the inside of the roll and begin to roll the pumpkin roll back up and carefully transfer to serving plate. Optional: Dust with powdered "sugar". To make powdered "sugar" simply blend a granular sweetener such as xylitol or Wheat-Free Market's Sweetener in food processor or Magic Bullet until a fine powder forms. 225 Calories, 21 grams Fat, 3.5 Total Carbs, 0.5 grams Fiber, 3 grams Net Carbs, 6 grams Protein per serving. So you used the powder or the drops? Shayna, I used the powder form for baking. Hi Shayna, this is the first time using Stevia drops. I prefer the powder when baking but don’t mind the flavored drops in my coffee! I really recommend giving Stevia Select a try. It is my favorite since KAL changed their formula. I hope Santa brings the cookbooks! Angela, did you follow the recipe as listed for the pancakes? The texture is really good and I was quiet proud of them. 🙂 This pumpkin roll has a bit more pumpkin but is similar to the pancake recipe. Always remember to sweeten to your taste, that can make all the difference! Good luck. thanks! I’ll give it a try. I’m not very good at the folding technique so maybe that was my problem. Thanks for another great recipe. I will try it with coconut cream on the inside! Theresa, let me know how it turns out! I hope you enjoy! I don’t have any unsalted butter right now. Do you think I can use salted and no salt or 1/2 of the salt/pinch? Debi, just omit the salt and use salted butter. Since there are so many other sweet elements, it should be fine! I don’t understand the “Invent your own option” thing! Would you please explain? Debi, please share this post on Facebook. Thank you! Hope I win one of the flavored liquids! Have never used them. I’m using the NuNaturals I got before they changed the formula, a long time ago. I don’t drink/eat many sweets so it’s lasted a long time. The Pumpkin Roll looks delicious! Thank you Joann and Good luck! 🙂 The hazelnut one is wonderful! Is there a reason why you don’t use Sweet Leaf stevia? I have tried it only once and I was not that impressed with it. It wasn’t bad but wasn’t outstanding IMO. I do miss the old KAL but I do like the Stevia Select! It looks like you take the parchment off before you roll it in the towel, yes? I have your cookbook “Satisfying Eats’ and LOVE it! I will make this for Thanksgiving. Thanks for all your hard work. It is an old brand of stevia that I no longer use. As a busy homeschool mom of 6 ages 24-12 coupled with some traumatic events in the last several years, the last thing I was concerning over was my health. That has changed, at 47 I am taking charge of my health, I have been gluten, sugar free for 17 days so far. I am going to make the pumpkin roll for Thanksgiving. Kerry good luck and I hope you enjoy the pumpkin roll! I made this today and I have to admit I was a bit anxious. I’ve tried to make cake rolls before and they never turned out! But the instructions and pictures helped so much and I think mine turned out great (for a first try). I made mine nut-free by using ground pumpkin seeds instead of almond flour and that worked very well. It tastes great too! Looks great Brenda and I am so glad you enjoyed the nut-free version! I just love your recipes! and pumpkin!. For the filling…do you whip the cream? Or add it as liquid? Whip it with the cream cheese. The filling should be thick. For the stevia, is that 1/4 tsp plus 1/8 tsp? Or 1/4 cup plus 1/8 tsp? I tend to use Swerve or Lakanto, so I’m uncertain of measurements for stevia. Stevia is VERY sweet and is only used in small amounts. It would be 1/4 tsp. plus 1/8 tsp. I don’t know how much Swerve would be needed but start with 1/4 cup and taste and add more if needed. Hi this looks amazIng! Do i use the egg yolks in the batter or discard? In paragraph two of the instructions it states to put the egg yolks into the dry ingredients. I hope you enjoy! Geez! moving too fast thank you! My filling wasn’t thick by my standards. And I followed the recipe to a tee. Any suggestions ? Veronica, keep beating the mixture until it thickens. With that much heavy cream and cream cheese, you should get a really thick filling. Hope this helps! Ok I will try that , I’ll let you know how it goes. Is it supposed to be like icing consistency? It’s supposed to be very thick. Very. You’ll need to spread it with a spatula it’s so thick. The cream cheese it’s self is already thick and when you beat the heavy cream enough, it will thicken up as well. Good luck! Hi Melissa. I’m going to make your version of the classic pumpkin roll using the dairy-free option. I just want to be clear that for the cake ingredients I’m only substituting 1/4 C of plant based milk for cows milk (plus adding the ACV), and omitting the sour cream. Is this correct? Marie, You still need 1/2 cup of dairy free options. Perhaps substitute coconut milk for the sour cream. Hope this helps. Great! That’s the answer I was looking for. Thank you. Hi, had a question about the stevia that is used in the recipe. The amount that is used, how does that measure like sugar? The reason I ask is I use Swerve and it measures cup for cup with regular sugar. TIA!? Hi, I know this is not the answer you are looking for but there really isn’t an exact conversion for stevia to sugar (or a sugar substitute that measures cup for cup). I would start with 1/4-1/3 cup and then taste the batter. I hope this helps and let me know how much you end up using so it can help someone else! What size pan did you use? I don’t see that mentioned anywhere. Thanks! Hi Karen, good question, my pan was around 10X16. Any jelly roll or small sheet pan, give or take a few inches should work fine.